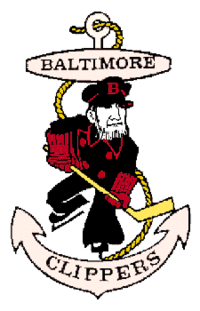 The Baltimore Clippers were an American professional ice hockey team. They were the first of three Baltimore franchise team entries into the American Hockey League which played on a minor league level beneath the older, larger, and more widespread National Hockey League which extended from the United States into Canada. There they played from 1962–1976. The Clippers won their division three times: 1970–1971, 1971–1972, and 1973–1974. The Clippers withdrew from the AHL at mid-season during 1974–1975 when the short-lived competing World Hockey Association's Michigan Stags were relocated to Baltimore as the "Baltimore Blades", playing on a major league level versus the NHL. The Blades used the Clippers old uniforms, the only difference being a Blades logo replacing the Clippers logo on the home white jerseys. The team returned to the AHL for 1975–1976, then transferred to the Southern Hockey League, where it was one of only three remaining teams when the league folded at mid-season in January 1977. The team was revived in 1979, playing two seasons in the Eastern Hockey League before that league disbanded. An earlier Baltimore Clippers minor league ice hockey team, in the old Eastern Hockey League, existed prior to moving to Charlotte, North Carolina in 1956 and becoming the first Charlotte Checkers team. 1974–75 Did not complete season. 1976–77 Southern Hockey League folded mid-season. The Official 1992-93 Baltimore Skipjacks Game Program.